The fall of 2012, I was in synagogue a lot. I’m talking beyond the High Holy Days. On 10/21/12, I spoke about Superman at Temple Beth Ami in Rockville, MD. 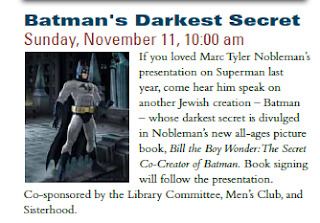 On 10/28/12 (as the hurricane Sandy approached), I spoke about Superman and Batman at Adas Israel in Washington DC. On 11/11/12, I returned to Beth El in Bethesda, MD. In the spring, I had spoken there on Superman. This time it was Batman.